The invoice number has to be entered in the Invoice column (DocInvoice) which, in the default settings, is not visible in the Transactions table. The list of Open invoices will be opened. Select the desired invoice and press Enter. The program completes the Transaction with the Description column, the Debit account and the Amount. Enter the account used to pay the invoice. In order for the amount to be deducted from the original invoice, the same invoice number needs to be used. If the corrective document (for example, a credit note) presents a different number that needs to remain available, such a reference can be entered in another column, like Doc. Original. 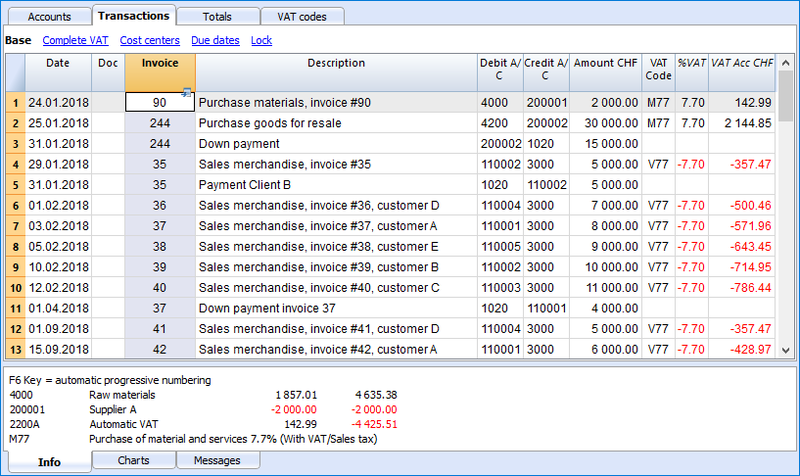 The Extract invoice rows command displays the transactions of the selected invoice. The command is available by clicking on the small blue symbol above at the upper right coner of the cell or with the right mouse button. The invoice rows can also be extracted by clicking on the invoice number with the right mouse button, Extract invoice rows command. The Open Invoice link command establishes the text that has been defined in the Suppliers' settings (Account 2 - Suppliers - Settings - Link to the Invoice document). For example, if the invoices have been created with Winword and saved in the Documents folder, these files can directly be opened by setting up the command line with the text 'C:\Users\myname\Documents\<DocInvoice>.doc' . The program substitutes <DocInvoice> with the text corresponding to the column and executes the command. In the command line, it is possible to also indicate other columns of the table by using their XML names. If the message 'File with extension considered unsecure' appears, add the extension (for example .doc) through the command Tools - Program Options, Advanced, File extension.